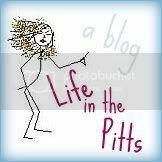 Life in the Pitts: If only I had a secret credit card...OH, WAIT. I don't know but I'd lead with a left hook!!!! Yikes...I'm not sure, but I can give you lawyer trick tips to help dig info out of him! What???? Oh, man- I'd be looking for that thing to go buy some last minute gifts! LOL! You can get him back by a fun day of shopping!! If it was me it would probably be best I didn't know, as I would rack it up in no time!! Think of the sky miles Helena! Also, I would probably go shopping. And then feel bad later.